After a one-year production hiatus, the Accord Hybrid returns for 2017 with some minor improvements to power and efficiency. Not much was wrong with this package in its pre-updated form and the plus points of the regular Accord are now that much more evident in this hybrid version. The Accord’s interior is spacious and offers a cabin that is well-built and features the sort of high-quality materials that you would expect in a modern Honda product. The controls and switchgear are easy to use although the touchscreen system that replaces the traditional buttons on higher trim models can be frustrating to operate. The front seats feature standard power adjustment and the leg and head room in the rear is class-leading. The battery pack is now smaller than before and slots in beneath the rear seats so that trunk space is no longer compromised. The split-folding rear seats available on the gasoline powered Accord are not available on the hybrid model though. The Accord Hybrid offers a level of handling and body control that places it firmly in the sporty category when it comes to this segment. The ride may be a tad firmer than you would find in the Toyota Camry but the improvements in driving feel and cornering ability may appeal to owners not wanting to sacrifice driving enjoyment when moving to a hybrid sedan. Refinement levels have not been compromised either and the Accord hybrid is a smooth and accomplished cruiser. A 2.0-liter gasoline powered engine with 143 horsepower and 129 lb-ft of torque is aided by a powerful electric motor which makes 181 hp and 232 lb-ft. Total combined output is 212 hp and a continuously variable transmission and front-wheel drive are standard. The 0-60 mph sprint takes under 9-seconds to complete and the strong torque output makes for quick overtaking times too. Overall performance compares well to the competition although the gasoline powered Accord models still stronger acceleration especially at higher speeds. What they won’t offer is the kind of fuel economy a hybrid is capable of. In the case of the Accord, fuel economy is a claimed 47/49 mpg in city/highway driving which places this sedan near the top of the hybrid sedan offerings. Three trim levels are offered on the Accord Hybrid, the base specification level is quite well appointed and includes dual-zone climate control, 17-inch alloy wheels, 10-way power driver’s seat and a 4-speaker audio system with Bluetooth audio streaming and USB connectivity. Safety items include a collision and road departure mitigation system, brake assist, LED daytime running lights, adaptive cruise control and a rearview camera which is part of the Honda LaneWatch and Honda Sensing group of safety devices. The EX-L Trim adds a power sunroof, auto-dimming rearview mirror, leather interior with heated front seats and memory function for the driver, 7-speaker audio system and a 7-inch touchscreen display that offers Apple CarPlay and Android Auto connectivity through the Honda Link system. The top Touring Trim includes a voice-activated navigation system, voice recognition for major controls, heated rear seats, LED headlights and auto-wipers. 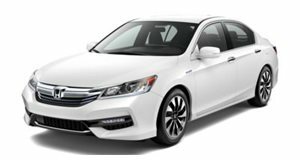 The mid-sized hybrid sedan segment has seen some rapid developments taking place and the subtly revised Honda Accord Hybrid is one of the most accomplished offerings. Performance and handling levels are among the best in class and the interior is spacious and well-insulated. Specification levels haven’t been compromised either and even the base trim comes with a full range of safety systems. Add in some very impressive fuel economy figures and the Accord becomes a must-drive option on any hybrid sedan shopping list.